Cassava is a major Nigerian staple from which we process so many Nigerian foods. Without cassava, we would not have the many varieties of foods we have in Nigeria. Cassava recipes include but are not limited to: Starch, Garri (Eba), Cassava Fufu (Akpu), Bobozi, Abacha and many more. Niger Deltans swear by Starch, the yellow swallow served with Banga Soup and Owho Soup. Click here for the recipe. If you want to know how to make Cassava Fufu in a blender, Click here for the recipe. See how I make the full option abacha that contains all the ingredients. Find out why this snack is also known as Air Condition. The best Nigerian snack for hot days! Cassava Fufu is seen as the most traditional of all Nigerian fufu meals. Most current generation babies do not even know what it is. 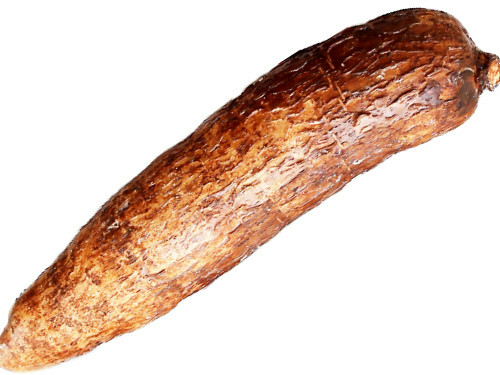 Click through to see how to process Cassava Fufu from cassava tubers (yuca). You can do this in any country where you can buy cassava tubers. Chew it, drink it, swallow it! That's how versatile these Garri grains are. Here's the traditional version of the leafy recipe, Nigeria's African Salad.